SBY Minta Century Diamankan? Ruhut: Anas Pembohong Besar! Permadi Sarankan Anas Urbaningrum Jadi "Whistle Blower"
JAKARTA - When the global financial crisis was at its height last November, Indonesia's Century Bank faced a severe liquidity crisis. Spooked depositors ran on the mid-sized consumer-oriented bank, depleting its capital base and raising fears financial contagion would have a domino effect on other wobbly financial institutions. 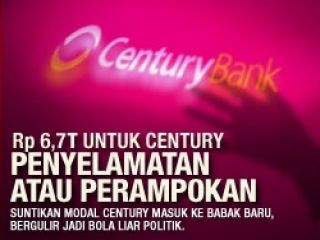 (Unmasking Cikeas Octopus: Behind the Bank Century Scandal). Yogyakarta: Galangpress.